Just 12 hours to deadline. 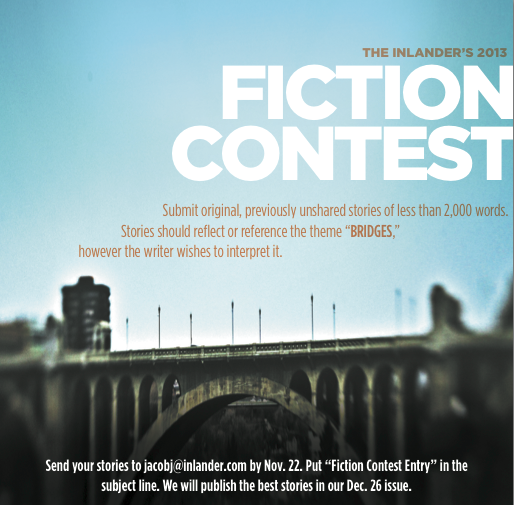 The Inlander's 2013 Short Fiction Contest closes at midnight tonight. Stories have really started rolling in the past couple of days, but there's still a little time left to get your masterpiece to us in time. Send your submissions to jacobj@inlander.com. Please put "Fiction Contest Entry" in the subject line. See our contest rules for details. Thank you to everyone who has submitted their entries this year. We look forward to reading your stories and sharing the winners with you in our Fiction issue on Dec. 26.